It’s 2018, and the oil price crash is long behind us. Alberta has returned to growth, and unemployment in the Wood Buffalo region is down. In the last article we wrote about the market, we noted increased demand and reduced supply vis-a-vis last year. The number of foreclosures on the market is even down since Christmas. These trends have continued, but one piece of information remains bearish: The “Close Price to List Price Ratio”. What is the Close Price to List Price Ratio? 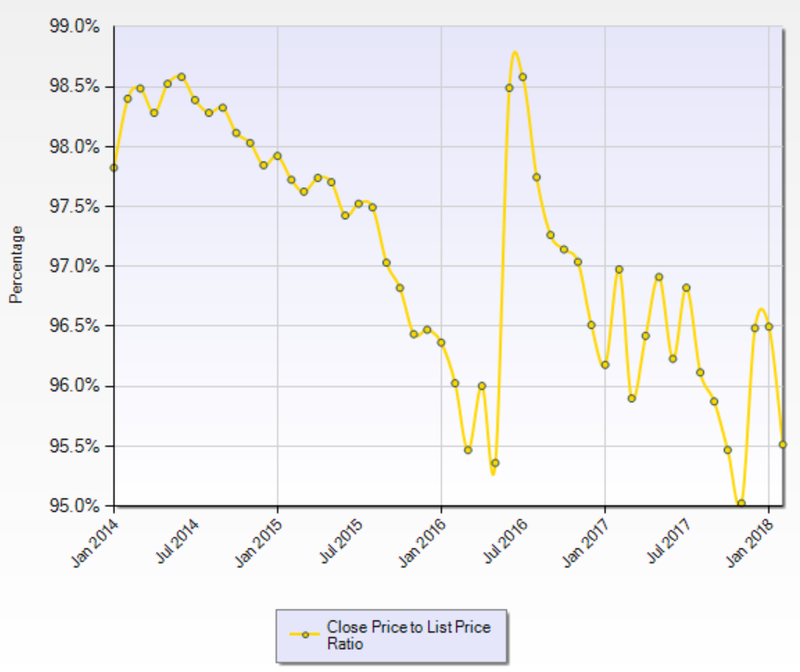 Also known as the “sale price to list price ratio”, this tells us the average discount that buyers and sellers are negotiating below list prices, in any given market (or market segment) in any given time period. You can find a little more information in this Motley Fool article. For example, let’s say Aaron Chalmers lists a home for $100,000 and sells it for his clients for $99,000, then the ratio would be 99%. In another example, buyer’s agent Aleaha Frigon, might help someone negotiate a $6,000 discount on a competing brokerage’s listing. This would give a ratio of 94%. An indication of a balanced market is when the ratio is between 98-99% (1-2% discounts). 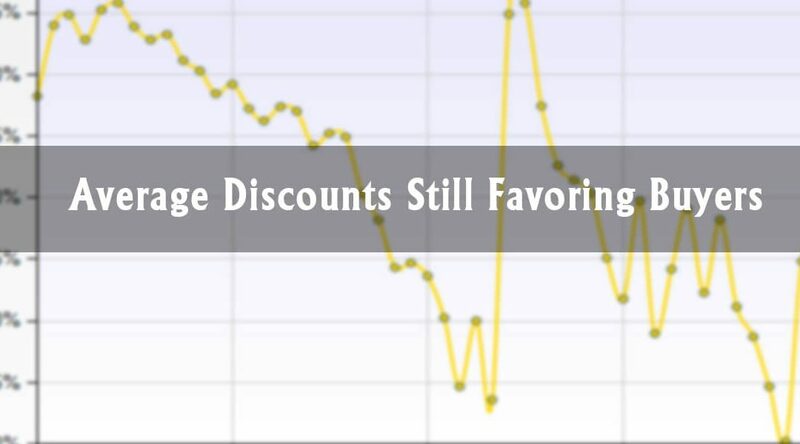 Once the average ratio crosses below 98% (2+% discounts), it represents one indicator of a buyer’s market. The above chart shows us, that negotiations have been favoring the buyer, for most of the last 3 years (save for a couple of months after the fire). So, Are We In A Buyer’s Market? Our opinion is “no”. We appear to have crossed the divide from buyer’s to balanced market, based on other, (more important) ratios, as well as the anecdotal evidence we encounter daily in our professional lives. But it is an interesting result, that sellers and buyers are still negotiating large discounts despite the number of buyers and sellers in the marketplace reaching “goldilocks” numbers (like the porridge – not too hot, not too cold). Number 1: I think this chart shows how seriously our community has been rocked by the events of the last 4 years. In other evidence, confidence appears to have returned, but it’s not showing up in this statistic. It’s a reminder that we will only know the future once it happens. Number 2: If you’re thinking of entering into a real estate transaction with us as a buyer or seller client, it’s good information to have that the average discount in the marketplace right now is approximately 3.5% for the market as a whole. Selling? Because we specialize, we have listing agents who are dedicated to selling your home for absolute top dollar (that’s all they do – see our YouTube page, for example). If you are planning a purchase soon, our specialist buyer’s agents will commit to finding you the best homes and negotiating the ultimate possible deal. If you’d like to hear about our solutions and results, please reach out so that we can give you the information required to help you make the best decisions.